How would you like to short circuit your cravings for sugar, break your brain’s addiction to unhealthy foods, control hunger and burn fat naturally without yoyo diets or fads? "Many people do not realize that a global obesity, pre-diabetes and diabetes epidemic is upon us. The occurrence of obesity, blood sugar problems, pre-diabetes, diabetes and metabolic syndrome is skyrocketing at an alarming rate. It is estimated that 1 in 4 Americans have one of these problems. 171 million people in the world have diabetes and that number will double by 2030. This is my all natural, side effect free contribution to this epidemic." "True healers have to have more than just a knowledge of their practice. They must also have compassion, a connection to a deeper source, a knowledge of their own healing process, a willingness to learn and expand, a keen eye on the present moment, and an awareness of the needs of the patient. James Whittle has demonstrated to me time and time again how he is not just a fantastic Acupuncturist, but he is one of those rare finds...He is a true healer." If you would like to lose weight naturally, lower your blood sugar with no side effects, and understand the profound knowledge the Chinese have used for thousands of years to lose weight and prevent diabetes and obesity, then I encourage you to take a few minutes and read this letter. I am convinced, as are hundreds of others who have used this program, that this information could change your health and therefore your life. I want to tell you the brief story of how I discovered this remarkable formula and learned the amazing healing knowledge of the Chinese, but first let me tell you who I am. 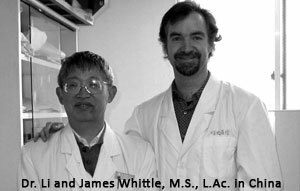 My name is James Whittle and I am an expert in acupuncture, traditional Chinese medicine (TCM), Chinese and herbal medicine, and nutritional therapy. After completing my undergraduate degree at the University of North Carolina at Chapel Hill, I completed a four year clinical Masters of Science (M.S.) degree in Chinese medicine and Acupuncture at Bastyr University. Bastyr has received multimillion dollar grants from the government (NIH), to do natural medicine research, and is considered the preeminent university in the United States for natural medicine education. When I first told my dad that I was going to study acupuncture and Chinese medicine, and not become a surgeon, he nearly had a heart attack. But that is a story for another time. For 15 years I have seen incredibly complex medical cases get relief with Chinese herbal medicine and acupuncture. I completed an 8 month internship at the Shanghai University of Traditional Chinese Medicine in China and have been to China 8 times to conduct research. I have also been asked to give lectures to medical doctors and students in China and in the US. In a 2009 lecture at the Shanghai University of Traditional Chinese Medicine, I shared with Chinese physicians, the history of natural medicine and herbal medicine in the United States, and how the natural medicine industry had been discredited in the early 20th century by powerful business interests. As more and more people have demanded side effect free solutions to their healthcare problems, natural medicine and herbal medicine have seen a resurgence of use in the USA in the past 20 years. There now exists a tremendous amount of good scientific research on herbal medicine, which makes it harder for business interests and the media to discredit herbal solutions. After 15 years of practice and after seeing thousands of patients in my own busy clinic and in China, I have created an herbal formula and ebook that combines all my knowledge from working with people, combined with the herbal “secrets” I learned in China for weight loss. Yes, Chinese physicians are often very secretive about the herbal knowledge they have, and they gave me their herbal knowledge because they understand how much suffering is going on in the world at this time. I knew that what I had learned would provide an easy and safe alternative to modern medicine. In fact, what I have learned is so incredibly easy it will surprise you, but you do have to follow the program. Most people do not realize that the Chinese are having their own battle with obesity, and that diabetes rates are skyrocketing in China, but it’s true. The doctors I worked with gave me their own insights and herbal formulas for dealing with the most complex weight loss cases imaginable, and I refined them in my own clinic with western patients to create this program. As I have worked with thousands and thousands of people I have noticed that at first, it is very hard for people to make big changes in their diets. I have seen many frustrated patients who had good intentions. They may have lost some weight and lowered their blood sugar for a brief period, only to have the weight return with a vengeance when they went off the fad diet or bogus program. I see people suffering all the time from not being able to lose weight, not to mention the personal anguish of feeling terrible, and all the money spent on being sick. Plus the money lost on junk and sugar filled food. Have you ever tried a diet and lost weight initially, only to gain it back immediately after stopping the so called “diet”? If so you are not alone. Oftentimes getting healthy and losing weight can seem like an immense chore, a difficult task like climbing Mt. Everest, and that is where I come in. I am going to make it REALLY EASY for you to lose weight, short circuit your cravings and break your brain’s addictions to unhealthy foods. All that I ask is that you TRY the program and follow my advice and see for yourself. In my clinic I have seen it all. I have seen women who could not lose weight no matter what they ate and how much exercise they did. I have seen men who could not lose stubborn belly fat. I have seen frustrated new moms who could not thin their thighs or flatten their bellies after childbirth…and I have been able to help so many of them with the principles you will learn and with the herbal formula I will share. A potent, all natural, organic herbal formula manufactured in the USA to “short circuit” sugar cravings, support normal blood sugar levels, and to support normal fat burning. An eBook packed with time tested principles for reaching your goals and ancient Chinese knowledge for lowering blood sugar naturally. Including stress reduction exercises (qigong) that can be done sitting or in bed. Who ever said losing weight naturally and sustainably had to be hard? It’s actually easy when you know how to short circuit sugar cravings and apply enjoyable natural weight loss strategies. While sitting comfortably with your back straight, place your left hand directly on top of you right hand. Then place both hands directly over your belly button. (For men place the right hand over the left hand). Relax your shoulders and arms. Relax your entire body. Inhale through your nose and exhale through your mouth. Inhale slowly and deeply while exhaling slowly and deeply. Try to make each breath slower and longer. Make sure all your muscles are totally relaxed. Continue for 5 to 10 minutes until you feel deeply relaxed. You have now lowered your stress level and cortisol level thereby reducing your tendency to store fat! Easy, right? It does take a willingness to use the information I provide, but I will give you step by step instructions to help you absorb the knowledge that the Chinese have used for thousands of years to lose weight plus the scientifically proven “master keys to weight loss” that I use with real people everyday. Learn knowledge the Chinese have used for thousands of years to stay slim, balance blood sugar and prevent diabetes. Learn why increasing lean muscle with simple movements like qigong, is better than aerobic exercise for burning fat. And what will really blow you away is our organic herbal formula that I spent 15 years researching and modifying in my own clinic with real patients like yourself. Each of the nine herbs was carefully chosen based on hundreds of years of use in China and based on extensive modern research. Gymnema, also called the sugar destroyer, was discovered in India, before it made its way into China. The herbs work together to metabolize fat, support healthy blood sugar levels, and “short circuit” sugar cravings. And the research demonstrates the herbs also help prevent problems that people who need to lose weight might encounter, including high cholesterol and high triglycerides. Our formula is manufactured in the USA at an FDA (Food and Drug Administration) GMP (Good Manufacturing Practice) certified facility. Five of the herbs are USDA certified organic. The entire finished product is analyzed in the lab to make sure it is free of heavy metals, pesticides or other contaminants. You can rest assured our formula is guaranteed to be potent, pure, effective, safe and easy to use. There are no known side effects for these herbs. Which of these trouble spots would you like to get rid of with our program? Our program is incredibly easy: You can also buy each of the items separately if you like. Here is what you do in 2 easy steps. It is not surprising to me anymore that MDs regularly come to see me for their healthcare: our program is easy, all natural with no side effects. If you are still skeptical, you can call my clinic anytime to verify us: (828) 254-4405. I have seen patients spend thousands of dollars trying to lose weight and going from one yoyo diet to the next and it saddens me to see this. You could also hire a personal trainer or coach. Most trainers cost at least $60 per hour so three times a week in the gym with a trainer will cost another $720 a month. A personal coach can cost more than $100 an hour so two coaching sessions a month would cost $200! Now add to this the cost of feeling horrible and having no energy to enjoy life or your family. You will quickly see that being overweight and feeling sick really costs a small fortune in money and in the quality of your life! Is your work affected by your symptoms? When your work suffers your livelihood suffers. People with weight issues or blood sugar related problems are absent 20% more from work than healthy folks. That takes a toll on your pocket book and on your mind. So, how do you potentially save THOUSANDS of DOLLARS and lose weight naturally? Well, I have done all the research for you…you prevent complications from occurring in the future with the Chinese Medicine Weight Loss Solution. But I am not going to charge you even my minimum hourly rate for an ENTIRE month of our program…your investment can be as low as $22.40* (*If you choose option # 4, the bulk rate choice), for a month’s supply of Dia-Slim…less than a gym membership, and WAY less than one session with a personal coach. Plus, for that price you will have received the FREE ebook as well with all my best info on losing weight naturally. Our program costs less than a typical cell phone plan and the best part is you don’t have to drive to and wait in a doctor’s office, get up at the crack of dawn and go to the gym, or starve yourself. And think about all the money you will save when you short circuit your cravings and blood sugar is back to normal…that alone could save you $1000s a month on expensive junk foods and snacks. No more binge eating means big savings. I had one patient that spent $90 a month on mocha lattes at Starbucks. Instead of potentially paying $1000s a month or more, why not give our program a try? Let’s do a quick comparison and see how much it costs to have diabetes. The American Diabetes Association reports it costs the average person with diabetes about $11,744 a year for health care, of which $6,649 (57%) is attributed to diabetes. And if you have to go to the hospital, please know that the average cost for a hospital inpatient due to diabetes is between $1,853 and $2,281 (PER DAY) due to diabetes-related chronic complications including: neurological, peripheral vascular, cardiovascular, renal, metabolic, and ophthalmic complications. I am super confident in this herbal formula and the information in the eBook, so do me a favor, give the Chinese Medicine Weight Loss Solution a try and if you don’t like it…I will give you your money back. I am so confident in the program that I have a 100% guarantee you will learn about later. Well it is really easy to understand. First, I love helping people and I love sharing what I know works. My patients will be the first to tell you how passionate I am about serving others and watching people achieve their health goals. I also have some amazing people who find the purest organic sources for herbs in the world. Because they deal directly with farmers and cut out the middleman I am able to get you these herbs at a reduced price. Even though the cost of these unique herbs is going up, we still can find the best price. Plus, since we are not selling to you from a retail store you are essentially getting this wholesale. Yes, but of course it is always wise to consult with your health care professional and often doctors know nothing about herbal medicine. If you want to schedule an online consultation with me, James Whittle, call our clinic at: (828) 254-4405. If I only have cravings for sugar can I take this? Yes, I have had much success for sugar cravings with this formula. Are there any side effects to the herbs? Answer: There are no known side affects to any of these herbs. Five of the herbs are certified organic the other four are sourced very carefully from farmers who don’t use pesticides. Does a lab analyze the herbs to make sure they are pure? Yes, each batch of formula is analyzed very carefully to make sure it is free of heavy metals and pesticides. Because I am so confident about this program and because I have seen it work with hundreds of people, I am offering you a 100%, ironclad, “more than risk free” money back guarantee. If you are not happy with the program for any reason, and return the unused portion of the product within 30 days, we will give you a 100% refund. This offer is “more than risk free” because even if you decide to get all your money back, you still get to keep the eBook (a $47 value, available on order option #3 and order option #4) as our gift to you. This money back guarantee is my promise to you. If you don’t like it, you don’t pay for it. I am taking all the risk out of this purchase…you risk nothing and could get back your health. If you do not like the program simply return it, no questions asked, no hard feelings and no crazy loopholes to jump through. Your payment is completely secure and very easy: we accept: VISA, MASTERCARD, DISCOVER, AMERICAN EXPRESS, and PAYPAL. Or you can call us and we will place your order. (828) 254-4405. Are you ready to stop sugar cravings, lose weight naturally and lower your blood sugar without side effects now? Please read through each option carefully and then click “order now” when you have your credit card ready. Limited time $17.00. You save $30.00! Only $39.95 plus shipping and handling! You Save $10.05! All for only $59.95! Limited time offer! You save $87.05! All for only $179 (only $22.40 a month). For a limited time you save $268.00! Thanks so very much for your time and patience in reading this letter and learning about the powerful natural weight loss solution we are offering you and your family. Thank you for supporting us and for supporting the farmers who work hard everyday in their fields with the plants that help to nourish and heal us.